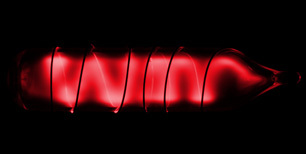 An illustration of radon, which is said to have a red glow in discharge tubes. Radon is a naturally occurring radioactive element found in most groundwater. It is the earth's only naturally produced radioactive gas and comes from the breakdown of uranium in soil, rock, and water. You cannot see or smell radon, but it can become a health hazard when it accumulates indoors. Over the course of a lifetime, consumption of drinking water containing radon can lead to an increased risk of internal organ cancers, primarily stomach cancer. Also, breathing radon released to the air from household water uses can increase the risk of lung cancer. However, radon in drinking water generally contributes a very small part (i.e., about 1-2 percent) of total radon exposure from indoor air. Point-of-use devices, such as those installed on a tap or under the sink, are not effective in reducing radon in your water. It is important to treat the water where it enters your home (point-of-entry device) so that all the water will be treated. Granular activated carbon (GAC) filter systems have been very effective at lowering water-borne radon levels, but the radioactivity that builds up in the filter bed may be of some concern. Install GAC systems only outside of your home. Aeration systems are also effective and do not accumulate radioactivity. Aeration systems mix the water with air in an outside-vented chamber. After aeration, the water is piped into the house free of radon.